Three big blue marlin dominated the Mississippi Gulf Coast Billfish Classic leaderboard this week as the 2014 event drew to a close. But in the end, it was the first one weighed that earned the biggest prize. Angler Deb Hebert, fishing aboard Joe Hudson’s 68 Hatteras Iona Louise, landed a 843.7-pound blue marlin on Friday after a fight lasting more than three hours. It turned out to be the largest marlin ever caught by a lady angler in Classic history and earned Hebert the Lady Angler trophy. She also brought in a 38.6-pound dolphin on Saturday. 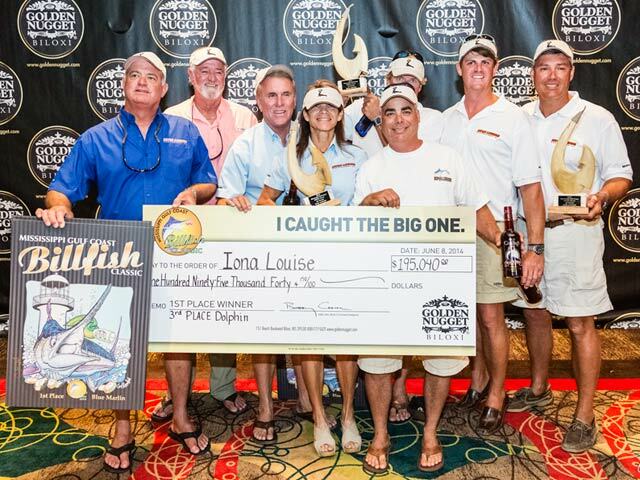 All told, the Iona Louise pocketed $195,040 for the first place tournament award and optional entries in the blue marlin division, top crew award and third place for the dolphin. Iona Louise will represent the MGCBC in next year’s Offshore World Championship. Tim Falzone and the Reel Worthless team earned $142,660 by landing a 539.1-pound blue marlin. The team switched boats after a fire nearly destroyed the 64 Viking convertible at the dock. They teamed up with Reel Fuelish, a 60 Skulley and showed their spirit and tenacity. The payout includes the tournament award for third place fish and optional entries in the marlin division. Andy Ryan and his team aboard Patience won second place in the marlin division after boating a blue weighing 680.1 pounds. Patience is taking home $30,530 in prize money for the week. Blue Smoker, a 53 Hatteras from Orange Beach, Alabama, was the big winner in the highly-contested tuna division. Angler Brian Replogle and the team earned $105,400 for their 173.3-pound fish. Bradley Dudly and the crew on Rise Up, a 52 Viking from Destin, Florida, took second place honors for a 158.5-pound yellowfin. Don’t Blink, a 56 Viking, from Sandestin, won $17,150 for the third place tuna that came in at 147.4 pounds. Sea Mixer, Relentless Pursuit and Quick Time also earned nice paydays by placing in the optional tuna categories. Bloodsport, a 38 Luhrs from Orange Beach, Alabama, took the top two places in the dolphin division. Brad Laquer and Pip Aljazra landed fish weighing 43.3 and 39.9 pounds, respectively, and added a wahoo optional for a check totaling $29,110. Done Deal also won an optional dolphin payout. Jimmy Reynolds on Marlin Darlin’ landed the heaviest wahoo, a 67.5-pounder, to win $48,475, while lady angler Taylor Harvey took second place honors with her 66.3-pound fish. Harvey was fishing aboard Four Reel, a 65 Hatteras. James Calloway on Cotton Patch came in third with a 61.3-pound wahoo. Freak on a Leash and Trader’s Hill also won optional money in the wahoo divisions and David Marshall earned this year’s top junior angler title with his 58-pound tuna, also caught on Trader’s Hill. 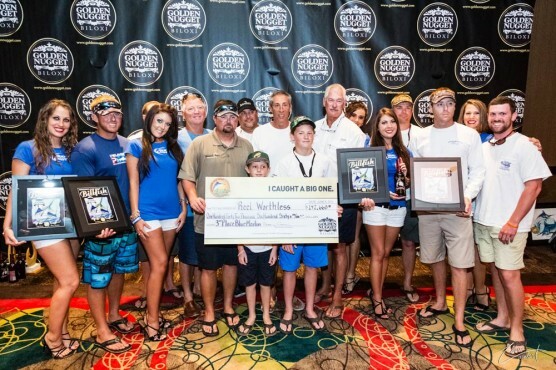 Conundrum, a 61 Viking based in Orange Beach, won the top Catch and Release title with 1,200 points. Anglers J. Ron Atchley and Dan Haeuser, with skipper Jimmy Crochet at the helm, earned a check totaling $41,275. Cheeseburger, a 50 Hatteras, was second in the release division, winning $30,195. Freak on a Leash took third place honors in the division, while Mollie also won optional cash after releasing billfish. The fleet of 53 boats were competing for a total of $1.1 million in cash prizes this year. Now in its 18th season, the Mississippi Gulf Coast Billfish Classic is one of the premier events on the competitive Gulf big-game fishing circuit.